STAMFORD CHARITY CUP FINAL: Captain Jack has a blast as Bourne seal another T20 triumph. Jack Berry smacked 82 from 49 balls for Bourne against Grantham. Captain Jack Berry was the star man as Bourne beat Stamford Town in an exciting Stamford Charity Cup Final at Market Deeping CC last night (July 9). Berry clubbed four sixes and seven fours in a 49-ball 82 as Bourne passed Stamford’s decent T20 total of 159-7 with seven balls and five wickets to spare. 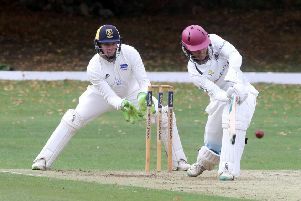 Stamford Town's Alex Birch cracked 70 from 53 balls i n the Stamford Charity Cup Final against Bourne. Stamford missed a difficult chance to dismiss man-of-the-match Berry when he was on 40. David Greenfield (23) was the only other Bourne player to make a useful contribution with the bat. Earlier Alex Birch had cracked 70 from 53 balls for Stamford with Simon Prentice adding 35. G. Smith (3-35) and Berry (2-36) were Bourne’s best bowlers. Stamford host the the Stamford KO Shield Final between Castor and Uppingham next Monday (July 16). Stamford Town 159-7 (A. Birch 70, S. Prentice 35, G. Smith 3-38, J. Berry 2-36). Bourne 160-5 (J. Berry 82, D. Greenfield 23, S. Prentice 2-38, S. Barratt 2-41).